Temple faces No. 21 Massachusetts and Rhode Island to finish the regular season. The Owls are tied with the Rams for the sixth and final A-10 playoff spot. TTN File Photo/Paul Klein Junior Kristen Marris earns both wins in this weekend’s games against La Salle. Marris allowed just one earned run to the Explorers. 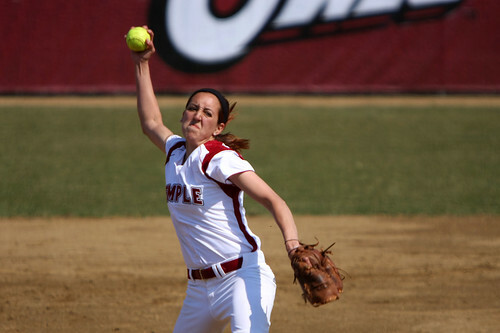 Temple softball’s attempt to clinch an Atlantic Ten Conference playoff berth will come down to the wire, as the Owls face their two last opponents, No. 21 Massachusetts and Rhode Island, in the final games of the season. The Owls are currently tied with Rhode Island for the sixth and final playoff spot in the A-10 Conference standings, but Temple will have to play a tough Massachusetts squad that owns a 13-0-1 conference record and a 33-7-1 overall record first. The Owls finished one spot shy of the conference playoffs last year when they ended the season seventh in the standings. So far, this year’s squad has fared slightly better. Though there are still four games to be played, the Owls (18-27 overall, 7-9 A-10) already have posted one more conference win than they did in 2009. Lately, the Owls have been doing just enough to keep their postseason hopes alive by winning four of their last six conference games. The team is looking to pick up a couple more wins to reach the A-10 playoffs for the first time since 2007. In a crucial doubleheader last Sunday, Temple took both games against the visiting La Salle Explorers by scores of 6-0 and 3-1. Junior pitcher Kristen Marris earned both wins by allowing just one earned run. She pitched 12 and two-thirds of the total 14 innings played in the series and added some key offense as well by going 3-for-6 at the plate in the two games. “We just need to pull everything together,” Marris said earlier in the season. Senior infielder Danielle Fagan, who leads the team in batting average (.319), hits (43) and home runs (nine), stepped up again for the Owls in the sweep of the Explorers. Fagan hit a two-run home run, her ninth of the season, in the third inning of Game 1 to give the Owls a 2-0 lead. In the sixth inning of the second game, Fagan came up clutch by adding a double that scored an insurance run and put the Owls ahead, 2-0. The Owls previously hosted the George Washington Colonials in a doubleheader on April 25 and won both games. Sophomore third baseman Rachel Knable led the Owls with two home runs and six RBIs in the games. Marris pitched both of those games as well and only allowed two hits in the first win (10-0) and just one hit in the second (4-0). Temple, however, was shutout, 5-0 and 2-0, last Wednesday by Saint Joseph’s, the current fourth-place team. In the past, coach Joe DiPietro has pointed to the team’s inexperience as an explanation for Temple’s midseason troubles. This season, the roster includes four freshmen and eight sophomores who have contributed significantly as starters or role players coming off the bench. The younger players, especially the freshmen, may have had difficulty adjusting to the greater number of games played at the college level, DiPietro said. Before the George Washington series, DiPietro said that if Temple earned five wins to close out the season, the Owls may have a shot to get into the A-10 playoffs. The Owls’ next pair of games will be a doubleheader with the five-time A-10 Champions, No. 21 Massachusetts, on Friday and Saturday. Then, the Owls will challenge the Rhode Island Rams in a doubleheader on Sunday. All of the games are on the road. Temple will benefit from several other conference games scheduled for Sunday, especially one between Massachusetts and Saint Joseph’s. The Hawks also play Rhode Island on Friday and Saturday. One concern for the Owls is replacing freshman pitcher Crystal Nyman, who has not been able to pitch against the last four opponents because of a torn meniscus in her right knee. Sophomore Lauren Spoo will continue to take the mound in relief for Marris, as Nyman is likely out for the rest of the season, DiPietro said. Nyman posted a 5-12 record and threw 90.1 innings. She finished the season with a 4.88 ERA. “We’re going to have to go with Kristen [Marris] and Lauren [Spoo] and hope it’s enough to get us through,” DiPietro said. A student explores how only children adjust to college differently than those with siblings.